Rocked by the economic crisis' drastic toll on its core industry, for the first time in its 175 years of life, the church in the Motor City will be led by a native son. After 46 months, the wait is over: this morning, Pope Benedict named Bishop Allen Vigneron of Oakland as archbishop of Detroit. Put another way, we have liftoff -- and the "Space Egg" is vacant. 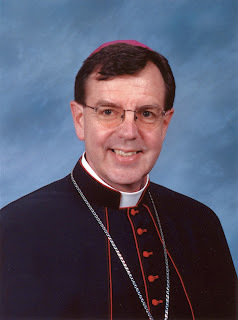 A priest and auxiliary of Hockeytown and rector of its Sacred Heart Major Seminary until his transfer to the 600,000-member East Bay church in 2003, the archbishop-elect, 60, succeeds his mentor, Cardinal Adam Maida, who reached the retirement age of 75 in March 2005, two weeks before the death of Pope John Paul II. Home to 1.5 million Catholics in the six counties of Southeast Michigan, the appointment to the nation's sixth-largest local church is the first made by the reigning pontiff to one of the US' ten biggest dioceses. A onetime staffer at the English desk of the Vatican Secretariat of State with a Gregorian licentiate in theology and a Ph.D. from the Catholic University of America, Vigneron was ordained a priest in 1976 and an auxiliary to Maida in 1996. Oft perceived as being homesick for Rock City while in the NorCal post -- where initial anxieties about the prelate's conservative repute were effectively put to rest and he went on to win wide regard among his priests and people -- the builder of the recently-completed $190 million Cathedral of Christ the Light returns to a Detroit church said to be suffering under the burdens of heavy debt and low morale. With the demand for archdiocesan services increased as the prospect of additional needed cuts looms against the backdrop of a dire economic picture, the challenges facing Detroit's tenth ordinary and fifth archbishop would, as one longtime friend of the appointee put it, "be a cross." As the battering taken by the region's crucial auto industry further rattled the Motor City church over recent months, Maida surprised even some of his own inner circle by springing into overdrive in his final lap in office, convening interfaith leaders, penning moving pastorals and calling for a government bailout of the Big Three, all in the hope of aiding the anxious community however he could. This generation's reigning kingmakers on these shores, most of dozen-plus bishop-proteges of the departing ordinary and his predecessor Cardinal Edmund Szoka have gone on to lead dioceses from the Rust Belt to the West Coast (and, as a group, dominated the years-long stakes leading to this morning's appointment). Now, with two more Detroit auxiliaries given local churches of their own in the last eight months, one of the celebrated stable returns to find just two top aides left. But even so, as Bishop Francis Reiss, the interim moderator of the curia, battles esophageal cancer, the incoming archbishop's lone auxiliary currently at full strength is the charismatic rising star from Texas, 47 year-old Daniel Flores, a figure in high demand both in the archdiocese and beyond. Later this morning, the traditional 10am presser is on at the seminary; the Cathedral of the Blessed Sacrament will host the installation, scheduled for the breathtakingly-rapid date of 28 January, three days after a long-planned celebration there marks Maida's silver jubilee as a bishop. As head of the ecclesiastical province encompassing all of Michigan, the archbishop-elect is the first of a foreseen group of four US metropolitans who'll receive the pallium from the Pope come June's end in Rome. More, as always, to come... in the meantime, though, it's worth noting that veteran readers will have seen the beam-up of "the anointed one" coming for quite some time -- some 54 weeks, to be precise. Named Fr Cirilo Flores, 60, heretofore pastor of St Norbert's in Orange, as auxiliary bishop of the SoCal diocese. An alum of Stanford Law who spent a decade in practice as a layman, the bishop-elect was ordained a priest in 1991, just short of his 43rd birthday. Flores fills the vacancy opened last year in the diocese of a million-plus members when then-auxiliary Jaime Soto was transferred to Sacramento. "Without Cost You Have Received..."